World population is aging rapidly. In 2010, 8% of the total world population was aged 65 years or older, and it is expected to triple by 2050. Due to increasing longevity and decreasing fertility rate, the number of older people would soon outnumber that of children below 5 years of age. Globalization of economies and the resultant migration has led to lesser family support for the older people. In India, according to the 2011 Census, those aged 60 years or above constitutes 8.6% of the total population. Among the states of India, Kerala has the highest proportion of elderly population (12.6%). Noncommunicable diseases are extremely common in old age, affect their activities of daily living and cause disability. Elderly population is also highly prone to develop mental morbidities due to various factors such as aging of the brain, cerebral pathology, comorbid physical illnesses, and socioeconomic problems such as poor social support and reduced economic independence. Breakdown of family values and family support systems have led to social isolation, economic insecurity, physical and psychological abuse, and psychological problems. The number of mental health (MH) professionals in India is inadequate to meet the MH needs of geriatric population. Many welfare schemes have been implemented for elderly by the state government, especially targeting the poor families. However, there is deficiency of an agency to coordinate the programs and services rendered by various government departments and other agencies, thereby limiting the availability of information on the programs for elderly. Recently, the Government of Kerala reviewed the Old Age Policy 2006 and deliberated on the research needs relevant to modifying the existing policy. The Old Age Policy 2006 had mentioned in its policy statement about empowerment of elderly people in the emotional domain but was silent about addressing the psychosocial issues in this population in its work plan. In this context, the objective of this study was to identify the MH needs of the elderly, with attention to special groups – elderly women, especially widows, slum dwellers, fisherfolk, disabled, return migrants, and tribal population and to identify gaps in existing MH services. The institutional ethics committee clearance was obtained for the study. Permission was also obtained from all the concerned authorities before the study. This study was conducted by the Departments of Community Medicine and Psychiatry of tertiary care teaching hospitals of Thiruvananthapuram and Alappuzha. The period of study was from January to October 2013. A cross-sectional study was conducted using qualitative methods to obtain in-depth understanding about the unmet MH needs of older persons and the process of delivering MH services to them. The study was carried out in five districts of Kerala selected purposively, namely, Thiruvananthapuram, Pathanamthitta, Ernakulam, Wayanad, and Kasargod. These districts were chosen because they represent the different geographical regions of Kerala and differ in the level of implementation of various welfare programs. District was the unit of study, urban and rural areas were covered in each district. Blocks nearer to (within 15 km), intermediate to (15–30 km), and farthest from (≥30 km) the headquarters of each district were included in the study. Data were collected primarily through in-depth interviews (IDIs) and supplemented by focus group discussions (FGDs). Various categories of stakeholders including policy and program managers, service providers, facilitators, and clients (elderly people) from community and institutions were the key informants for the IDIs. FGDs were done at client and caregiver levels to elicit their opinions, attitudes, and practices. Separate FGDs were conducted for males and females, in rural and urban areas and for different socioeconomic groups. This approach helped in synthesizing multiple sources of information till redundancy, to rationalize and objectively balance the evidence. The participants selected were key stakeholders from each category at various levels – state, district, block/panchayat, facilitators, and clients. At client level, elderly from homes and institutions, both males and females, covering rural and urban population, from different socioeconomic strata (above poverty line [APL]/below poverty line [BPL]) and age groups (60–80 and 80+) were included. In addition, interviews were done with client categories belonging to special groups, namely, widows, disabled persons, slum dwellers, fisherfolk, return migrants, and tribal communities [Table 1]. Caregivers of bedridden elderly, from both urban and rural areas, were also included in the study to identify their specific issues. Purposive sampling was followed in the selection of participants till redundancy of data. A total of 166 IDIs and nine FGDs were carried out across all categories covering the five districts. The number of IDIs and FGDs conducted in each district are given in [Table 2]. 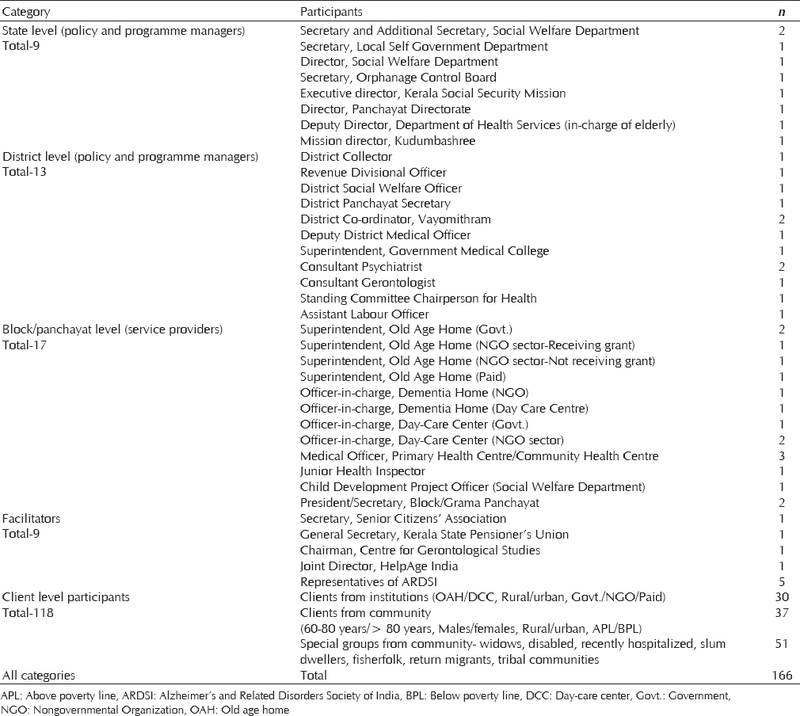 Interview schedules with open-ended questions, separate for each major category of stakeholders, were used to collect data through IDI. FGD guides were also prepared in tune with the study objective. Study instruments were prepared by the principal investigators (PIs), refined and finalized in a workshop involving subject experts, methodology experts, and representatives from the department of social justice. They were translated to the local language and pilot tested before administration to stakeholders. The study was implemented at state and district levels as follows. 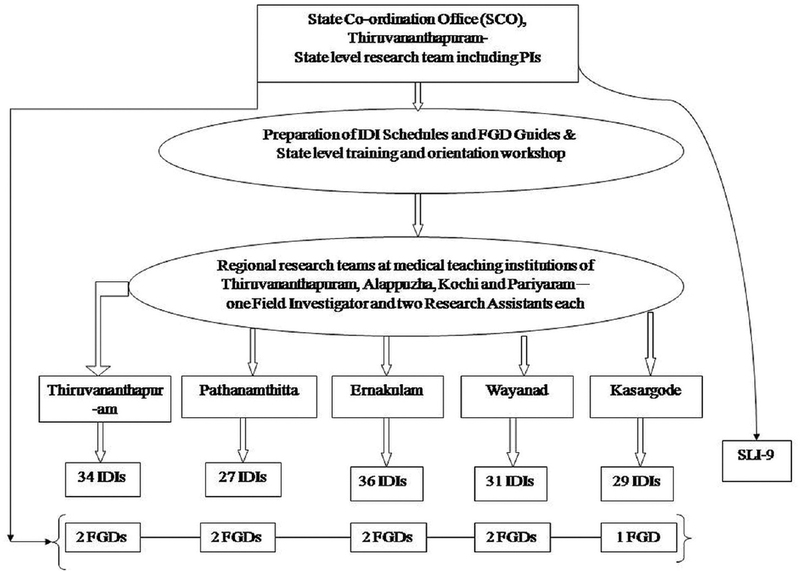 State level coordination of the study was done by the research team, including PIs, at the State Coordination Office (SCO), at the tertiary level teaching center at Thiruvananthapuram. The faculty from the Departments of Community Medicine of tertiary care centers at Thiruvananthapuram, Alappuzha, Kochi, and Pariyaram functioned as regional research teams, and they monitored the district-level activities. In each district, all IDIs at the district and block levels were done by investigators from the regional team including qualified public health experts, psychologists, and sociologists. All state level interviews (SLI) were conducted by the PIs, qualified public health experts, psychiatrist, and sociologist, with the past experience in qualitative research. Informed consent was obtained from the participants by the interviewers. All interviews were done in the local language, field notes made, and audiotaped with the participants' permission, ensuring privacy and confidentiality of the data. Transcription and translation of the recorded interviews to English were done by research assistants, maintaining the content, and spirit of expression in local language. The translated version, along with the tapes and local language versions were transmitted to the SCO for processing and analysis. The PIs were in charge of data analysis and report writing [Figure 1]. Quality assurance measures were adopted at every step – project designing, implementation, and analysis. A state-level training and orientation workshop was conducted for the field teams, site investigators, and research staff at SCO, to provide hands-on experience for IDIs. At the end of each interview, the interviewer was instructed to check the schedule for completeness. Further, all the interviews were reviewed for quality, during the initial phase, at the SCO, and a random checking of 10% carried out later on. Quality assurance visits were made by the SCO to all selected sites. FGDs at all sites were conducted by the PIs to maintain uniformity. The data were analyzed manually by the team at SCO. MS Excel Version 2007 was used for the organization and retrieval of data. Semi-quantitative approach was followed in the analyses and presentation of report wherever possible. The steps used for analysis included free-listing of responses, grouping of segments showing similar ideas, identifying the emerging themes (domains), giving numerical codes to the domains, summarizing the different categories, and preparation of comparative tables. The themes derived from inductive coding process were coded quantitatively and percentages calculated. Qualifiers and corresponding adjectives were used to report the opinions expressed by various stakeholders as follows: If the proportion of respondents, from a particular group of stakeholders, giving a particular opinion was <10%, it was coded as <1+ (very few), 10%–24% as 1+ (some), 25%–49% as 2+ (approximately half), 50%–74% as 3+ (majority/over half), 75%–89% as 4+ (most), and ≥90% as 5+ (almost all) [Table 3]. Analyses of FGDs were used to triangulate the findings of IDIs. In the report, the term clients, elderly, older people, and senior citizens are used synonymously. The elderly population from within the community, institutions, and other stakeholders including superintendents of institutions such as old age homes (OAHs) and day-care centers (DCCs), facilitators, members of Panchayati Raj Institutions (PRIs), and Medical Officers (MOs) of peripheral health institutions were asked about the MH needs of senior citizens. Only one-third of the elderly reported that their mental well-being was satisfactory. Half of them were sad, unhappy, or worried, for the following reasons: absence of own source of income, being dependent on children, lack of emotional support, ill treatment by children, or a solitary life. Nearly half of the MOs and some from other categories also agreed to this. The feelings of helplessness and hopelessness, suicidal thoughts, and anxiety about the future were reported by nearly half of the elderly from institutions, but by very few from the community [Figure 2]. “I feel isolated. They (Children) don't want to live with us. It gives me a lot of grief that I can't see my grandchildren ………. Being retired brings its own problems. Along with that, there are problems like loneliness, mental tensions, dietary issues, lack of sleep, etc.” reported an APL, rural, elderly from Wayanad. Most of the superintendents of OAHs and majority from other stakeholder categories including MOs mentioned that mental illnesses such as Alzheimer's disease, depression, anxiety, and sleep disorders were distressing problems for senior citizens, especially in the age group above 80 years. However, only some of the elderly identified these as major problems. Loneliness, isolation, neglect, demise of spouse, and subsequent sense of insecurity of widowhood were reported as distressing psychological problems of elderly, by some from the community and half of those from institutions. Majority of the other stakeholders had the same opinion. Some MOs reported somatization problems such as aches and pains, tiredness, or loss of sleep among elderly. Half of the elderly from the community said that the intrafamily relationships were satisfactory, though none of the other stakeholders agreed to this. About half of the elderly indicated that they had adjustment problems within their family – poor interaction among family members, lack of feeling of togetherness, loneliness, isolation, and having no role in decision-making regarding family matters. This view was shared by other stakeholders. Some of the elderly participants were living alone, either due to widowhood or children's migration, and had problems-related to that, like poor health-seeking behavior. Lack of opportunity for social interaction was mentioned by some participants as a social issue. “I am old, living alone. Sometimes I can't cook for myself and have to take food from the neighboring houses. My biggest woe is this isolation and loneliness. I brought up my children giving them utmost love and care. Now what is my fate? I am also a human being. I can't help worrying. Moreover, my illnesses add to my worries,” reported a BPL, rural, elderly from Kasargod. Majority of the clients from community reported that they did not partake in any social activities, festivals, or get-togethers and were not members of any social, religious, or political groups. This was mainly due to lack of interest, physical illness, weakness, etc. Hospital visits were the only occasions for exposure to the outside world. Nearly half of them had limited social activities – some attended functions such as marriage and funerals or visited churches/temples or attended festivals. Some of them were involved in social and religious group activities like Kudumbashree (a community organization of self-help groups of women in Kerala under a Woman Empowerment and Poverty Eradication Programme of the Government of Kerala)/Gramasabha (constituted by the voters of every Gram Panchayat constituency or ward) meetings and church activities. Very few reported to be office bearers of social and religious groups and were very active in their social life. The perceptions of elderly living alone were elicited regarding the support expected by them. Half of them wanted support of their children or close relatives. Some of them opined that there should be support from government or local community. A few suggested that the best option for those who are living alone would be an OAH. Majority of the elderly from institutions and community were having no source of income on their own. More than half of them from the community were dependent only on their children for financial support, but only some from the institution were so, and less than a quarter of the clients from community and some from institutions were having their own sources of income by the way of business or property. Some from both categories were getting a service pension or family pension. Half of the elderly from institutions and majority from community who were not having their own source of income reported that they were receiving one or the other of the welfare pensions. Nearly half of the elderly from community and majority of elderly from institutions spent their income on personal needs. About half of them from community and some from institutions shared household needs with their income. The income was reported to be inadequate to meet the expenses, more so, by elderly from community. Most of the elderly population who participated in the study were financially insecure; either by not having their own source of income or their income being inadequate to meet their needs. According to the elderly, those unproductive among them were considered to be a financial burden, especially so, if their health was impaired. This would lead to diminishing nutritional status and poor health-seeking practices. Almost all of the other stakeholder categories, namely, superintendents of OAHs, facilitators, and representatives of PRI and MOs had the same view. “If there is financial independence and physical fitness, elderly parents will be looked after to a greater extent by children. If both are lacking, life becomes miserable for them. This is more a problem for women as their life expectancy is more than that of men,” opined a district-level provider from Thiruvananthapuram. Abuse from family members, primarily from in-laws or their own children, was reported by some elderly. Nearly half of the facilitators and some of the other stakeholder categories considered elder abuse to be a serious issue. Physical, verbal, and psychological abuse were the major forms of abuse mentioned by the participants. Psychological abuse included neglect and disrespect by children or other family members and imposing financial restrictions. Either the elderly were avoided by the society or social interactions were prohibited by their families. The shift from joint family to nuclear family type and the resultant family and social environment was reported as unfavorable to elderly by some from all the stakeholder categories. When the responsibility of caring for two generations falls on the family, priority goes to the younger generation. Older people are provided with food and clothing without any consideration for their emotional needs. Sometimes, they lack privacy in their homes. “In many homes, older people are considered as furniture. Let me put it bluntly; the elderly segment is considered as a commodity by people in many families and communities and would like to dispose off at the earliest. They are given food just as we give to a dog. Since hunger is a basic need, they eat a little out of it,” opined a Medical Officer from Ernakulam. Old age homes run by the government, NGOs, or private agencies were providing institutional care to elderly. DCCs and Dementia Care Centers (DECCs) were providing family support services. Elderly participants from institutions were asked about why and how they came to the institution. Half of them were staying there for 5–10 years and the rest for <5 years. Approximately, half of them stayed with their children or in their own houses before their admission to OAHs. One-third of them were staying alone; some of them having no land or own house or staying with siblings. Of the inmates interviewed, almost all opined that it was their own decision to come and stay in the OAH. Among those who came there on their own, approximately half did not have anyone to look after them. Some of them came because of ill treatment by their children or difficulty to get along with son's/sibling's family. Some others were single, had no one to look after them, could not work and hence, had no source of income, or felt shame to have food without doing any work. The elderly individuals were attending DCCs to spent time and share their problems with others. “Nobody at home. I was alone and I couldn't bear that loneliness. This is a heaven for me. I can see people, talk to them, and I am happy. As I hail from a joint family, I love the company of others,” reported a female inmate from OAH, Ernakulam. “My son used to abuse me verbally. That was beyond my tolerance limit. That is why I left my home and came here,” said a male inmate from OAH, Kasargod. The elderly in the institutions were asked about visits by their relatives and other social interactions. Majority gave a negative reply, while some of them had occasional visitors; one of the important reasons being that they were ashamed of the elderly staying in OAHs. Occasional telephone calls from friends and well wishers were reported by some. Other means of social interaction reported by very few were visits by students and teachers from schools and colleges, people from church-based groups and interactions while attending the prayer at churches or festivals. “No one comes to visit me here. Here there are people who have 8-9 children each, nobody comes to visit them. Even if I need something, I do not contact anybody at my home,” reported an elderly from OAH at Pathanamthitta. Majority of elderly from OAHs did not like to go back to their families, as their past experiences were not good or their children were not financially sound and did not want to disturb them. Only some wished to go back, but half among them were apprehensive of not being accepted by family members. Very few elderly mentioned about any steps being taken at institutional level to help them go back to their families, but majority of superintendents (except those of private homes) claimed that they tried their best to send them back home. In OAHs, nearly half of the inmates and majority of superintendents admitted that there were occasional interpersonal problems between inmates. These were either sorted out among themselves or with the help of other staff members. In many institutions, physically and mentally challenged persons, who required special care, special wards, and more attention were made to share the same facilities as the elderly people. According to some superintendents, this could create difficulties for the latter. However, this arrangement had some advantages also: the physically or mentally challenged, comparatively “young old” people, helped the “old-old” in their minor chores and the latter seemed to be happy in the company of the former. The relationship with authorities was reported to be satisfactory by half of the inmates. Only, a few complained that the staff was unresponsive to their problems. Regarding MH services provided in the OAHs, over half of the inmates reported that no such services including counseling and psychiatric care were available in these institutions. Only some institutions provided counseling services, ensured opportunities to interact with people outside, or took the inmates to mental hospital when needed. Some of them received psychiatric medications as per the psychiatrist's prescription. “It is better not to have mentally ill inmates living along with elderly—due to lack of sleep, they may talk loud or roam around at night and disturb others. Dementia patients definitely need separate room, so also bedridden patients-but now everybody is put together in the dormitory,” reported the Superintendent of a Government OAH from Pathanamthitta. Very few older persons from the community and institutions reported that they consulted a psychiatrist or availed counseling services. A quarter of them from institutions said that they consulted general physicians or doctors visiting the OAHs. MOs from peripheral health centers also shared the same view. Approximately, half of the MOs opined that stigma regarding mental illnesses still existed in the community, leading to delay in psychiatric consultation and diagnosis. The other reasons for poor utilization of MH services were perceived to be poor availability and accessibility of services at the community level, lack of specialists, ill-equipped MH centers, and geriatric psychiatry being underdeveloped as a specialty. Lack of family support on the one hand, and the absence of a comprehensive social security system and dedicated health services – approachable and comprehensive enough to meet the needs of the elderly – on the other hand, led to poor-health seeking, irregular treatment, and lack of control of chronic illnesses. MH needs of special groups of elderly, from tribal, slum, and coastal communities; widowed population; and return migrants, were assessed from clients, as well as from facilitators, members of PRIs and MOs. Although they shared many of the problems of general population, the prevalence of some of these issues was more among certain groups. MH issues such as alcohol and tobacco use disorders were frequent among the tribal elderly population. Low level of education, lack of mutual respect among the family members, financial instability, dearth of savings, isolation, neglect, and abuse of the elderly are the other social problems that are more prevalent among the tribal communities. Lack of accessibility and affordability of medical-care services and lack of belief in modern medicine (with a preference to traditional medicine) resulted in poor utilization of health-care services. “Alcoholism and resultant violence against elderly parents is a problem of great magnitude among the tribal population. A crisis seen among the tribal senior citizens is that the family members are not willing to take care of them if they are sick, especially hospitalized. If they are in the hospital for two days as a bystander to an elderly parent, there won't be any money to meet the day to day household need,” reported a tribal promoter from Wayanad in an FGD. Loneliness, undisciplined life, and alcoholism were rampant among slum dwellers. In the coastal community, widowhood and dependency on children were mentioned as the common life situation. Alienation, isolation, and loneliness were the specific problems faced by return migrants to a greater extent as compared to the rest of the elderly population. Solitude was a major problem faced by widowed elderly across all socioeconomic strata. The social status of widows was poor; lack of financial security and having to depend on their children exacerbated their problems. They experienced greater abuse and psychological problems. Poor health-seeking practices and nonadherence to treatment were also reported. “Since we were away most of the time, we are strangers in this place-we don't have any friends; and neighbours keep a distance. those who come to help us, we cannot depend—at night, I stay awake as I am afraid of burglars breaking in---we always live in anxiety and fear,” reported a return migrant from Pathanamthitta. Specific problems of elderly above the age of 80 years (oldest old) included nutritional problems and MH issues such as memory loss and Alzheimer's dementia. Acute and chronic physical problems worsen with advancing age, leading to more dependent states – physically, socially, and financially. MH needs were poorly addressed among the bedridden elderly. “Ninety percent of Alzheimer patients are elderly, most of them above 75 years. All elderly's problems are applicable to them. Added to that, they have memory loss too,” reported a facilitator from Thiruvananthapuram. Since primary caregivers were mostly family members, the specific problems that they faced in caregiving were enquired about. The caregivers of the oldest old population themselves were also elderly, and they were distressed with similar problems. Deteriorating health status (due to physical and mental stress) was noted as an important issue. This was more relevant when an elderly spouse, son, or daughter was the primary caregiver. There were adjustment problems in the family when the daily routine of the family members got affected owing to the demand on the caregiver's time to care for the elderly person. When the primary caregiver was a son/daughter, lack of sharing of responsibility of caregiving by other children of the bedridden elderly was a major concern voiced by them. Limited social interaction and recreation were also pointed out as problems faced by them. All these problems impair the emotional bonding and sincerity of caregivers, and at times, the elderly persons become victims of their harassment. Many of the caregivers were worried about the future. “The condition in my house is pathetic. I want him to die at the earliest, bedridden for the last 10 years, nobody to help us. None of the married children support us. Myself and an unmarried daughter look after everything,” said an urban caregiver from Ernakulam. Many of the caregivers mentioned about palliative care programs and home nursing services. Majority of the bedridden elderly were getting palliative care services either from nongovernmental agencies or local self-government. However, there were a couple of them living in rural areas that were not getting any of these services. Nonavailability of trained home nurses was pointed out as a problem for those who could afford to have them. The home nurses currently available were mostly untrained and unaffordable to majority. “Non-availability of a trained home nurse is a big problem. A home nurse should have basic knowledge and skills in giving first aid, giving insulin injection, putting a Ryle's tube etc. I am paying rupees ten thousand to the untrained maid for looking after my mother. A trained graduate nurse will get only six or seven thousand in private hospitals. They will work for even less than that. But will they come to our house?” reported an urban caregiver from Thiruvananthapuram. This study assessed the MH needs of the elderly population of Kerala. Depression, anxiety, insomnia, somatization, and dementia were reported to be the common MH problems in older people, especially above 80 years. Severe symptoms of depression, including suicidal thoughts, were more common in elderly people in OAHs compared to those living with their families. There was a dearth of qualitative studies assessing MH needs of elderly. In a cross-sectional study done on elderly aged 60 years and above, in Mysore, anxiety and insomnia, somatic symptoms and depression were found to be the most common MH problems. In 2011, a comparative study done in Kolkata on elderly population found that greater depression and maladjustment were reported by institutionalized, compared to noninstitutionalized individuals. Loneliness, isolation, neglect, insecurity, and poor health-seeking behavior were reported to be common in this population. Among special populations, loneliness was reported to be more rampant in widows, tribal population, migrants, and slum dwellers. Bhatia et al. reported loneliness to be higher in elderly females than males, especially in those living alone. 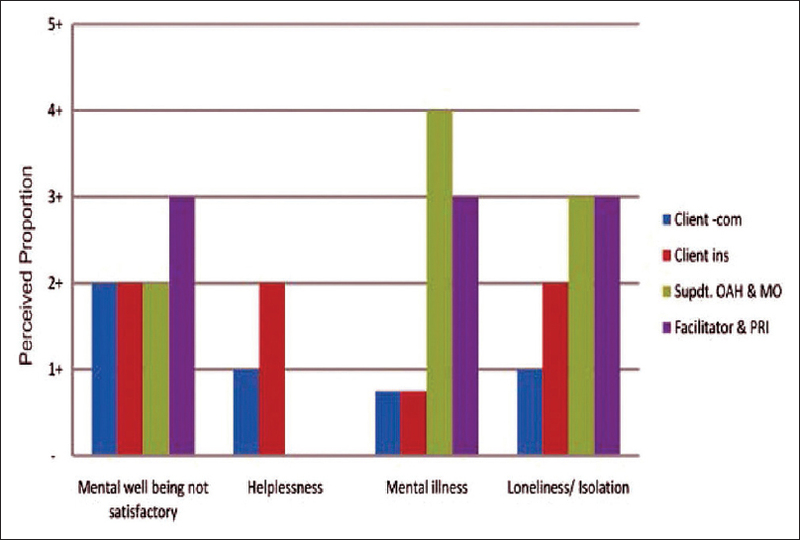 Singh and Kiran reported that loneliness correlated positively with widowhood, economic deprivation, and poor health. Steps have to be taken to alleviate isolation and loneliness in elderly. This can be helpful in reducing poor physical and MH in this population. Elder abuse, physical, verbal, and psychological, was reported to be a serious issue by various stakeholders in our study. Financial insecurity and dependence were reported to be factors which contribute to elder abuse. Among special groups, neglect and abuse were found to be more among widows and tribal elderly. A survey done in Kerala reported that nearly 60% of older people experienced some form of abuse in their household. Neglect and verbal abuse were more common, followed by physical abuse and material exploitation. Elderly women, especially widows, the oldest old, and physically immobile were more vulnerable to abuse than others. A cross-sectional study conducted in Maharashtra found that most of the elderly individuals, being unemployed, were neglected by family members; they felt loneliness, sadness, and depression. A content analysis of newspaper reports done in India found that physical, verbal, psychological and financial abuse, and neglect were the various types of elder abuse. Older women were found to be predominantly at risk for financial, physical, and sexual abuse, particularly after the death of spouse and when financially dependent. In our study, it was found that the social activities and interactions of elderly population was generally poor, especially so for the institutionalized group. Majority of the latter seldom interacted with their family members and even preferred not to return to their families. In contrast to the findings from this study, a cross-sectional study done in inmates of OAHs in Gujarat in 2004 reported that 49.2% inmates had good social interaction with family members and 59.8% were visited by family members in the OAHs. Interestingly, desire to go back home was not significantly associated with social interaction with inmates or family members. Although MH problems were common in elderly population, utilization of MH services was found to be poor, both in community as well as institutions; especially so for bedridden elderly. Stigma regarding mental illnesses, poor availability and accessibility of services, and lack of specialist centers and services were reported to be the reasons for this. Family support services like palliative care services were not available in rural areas; home nurses were mostly untrained, unavailable, and unaffordable. Steps to enhance the availability of MH services, workforce and infrastructure, are required. So also, it is imperative to provide training to home nurses and improve the availability of palliative-care services to rural areas. A study done in Kerala found the proportion of elderly people attending District MH Programme (DMHP) clinics conducted by a medical college (16.5%) to be significantly greater than that of their Psychiatry OPD (9.5%). They concluded that decentralized services are more accessible to older people and that DMHP can be strengthened by focusing on their special needs. In an evidence-based commentary, Tiwari et al. gave suggestions to bridge the vast gap between the availability and requirement of geriatric MH (GMH) services in India by deprofessionalization and decentralization of GMH services and also through workforce and infrastructure development. Caregivers of older people, primarily the family members, were burdened with their own physical and psychological distress. Difficulties in time management, lack of sharing of the responsibility of caregiving by significant others, shrinkage of their own social milieu, and lack of family support systems were the common problems reported by caregivers. A cross-sectional survey done in Pakistan found that the caregivers of dementia patients had a significant decline in MH compared to those of physically disabled ones, but no significant difference was observed in the burden of care between the two groups. Enhancement of respite care services and DCCs, which would temporarily relieve family members of their caregiving duties, is needed. Long-term effects of caregiving and the impact of strengthening family support services on the caregiver's physical and MH, have to be studied. This study could assess the MH needs of elderly population from a variety of stakeholders including the older people from community and institutions, caregivers, and service providers. Although purposive sampling was employed, representativeness was ensured. The experiences of elderly and the perceptions of caregivers and different stakeholders could be captured. Triangulation of methods, resources, and data were used for this study. Quality assurance was ensured at different stages of the study. A quantitative assessment could have added to the richness of the information obtained but was not included because of logistic reasons. MH problems are common in elderly, especially in widows and institutionalized population. Loneliness, isolation, and neglect were reported to be frequent, even more so in special populations such as widows, tribal, and migrant population. Financial insecurity and dependence were contributing to elder abuse, which was reported to be a serious issue in older people. Social activities and interactions were low, even worse in OAHs. Although MH problems were commonly reported, utilization of MH services was low. Accessibility and availability of MH services were found to be poor. So also, the available family support services were found to have caveats. This adds to the caregiver burden reported by the family members of elderly people. More studies to assess the MH problems of older people and their caregivers are needed. Efforts are to be taken at the community level to reduce their loneliness, isolation, neglect, and abuse. Infrastructure and workforce development should focus on setting up geriatric units and training medical and paramedical professionals in geriatric care. Enhancement of family support services such as palliative care, home-nursing care, DCCs, and respite care centers are required. OAHs and DECCs, with better infrastructure and trained workforce to give specialized care, are needed. Provisions for MH care delivery at these institutions need to be scaled up. These recommendations were provided to the government in the final report of the study for further action. We express our gratitude to the faculty members of Departments of Psychiatry and Community Medicine, who constituted the regional research teams at Government Medical College, Thiruvananthapuram; Government TD Medical College, Alappuzha; Co-operative Medical College, Kochi, and Academy of Medical Sciences, Pariyaram. We are also grateful to the field staff that helped us with the data collection, transcription, and translation. Our gratitude is extended to all the clients and stakeholders who participated in the study wholeheartedly. This study was funded by the Department of Social Justice, Government of Kerala, through the Kerala Social Security Mission. World Health Organization, National Institute of Aging, National Institute of Health, US Department of Health and Human Services. Global Health and Aging. NIH Publication Number 11-7737. Geneva: World Health Organization; 2011. p. 1-3. Central Statistics Office, Ministry of Statistics and Programme Implementation, Government of India. Elderly in India – Profile and Programmes 2016. New Delhi: Government of India; 2016. p. 15-44. Verma R, Khanna P. National program of health-care for the elderly in India: A hope for healthy ageing. Int J Prev Med 2013;4:1103-7. Prakash O, Kukreti P. State of geriatric mental health in India. Curr Tran Geriatr Gerontol Rep 2013;2:1-6. Old Age Policy 2006 (Malayalam). Downloaded from the Official Web Portal of the Government of Kerala; 20 November, 2012. Available from: https://www.kerala.gov.in/documents/10180/46696/Old%20age%20Policy%202006. [Last accessed on 2018 Jul 26]. Boralingaiah P, Bettappa P, Kashyap S. Prevalence of psycho-social problems among elderly in urban population of Mysore city, Karnataka, India. Indian J Psychol Med 2012;34:360-4. Bothra N, Dasgupta M. A comparative psycho-social study of selected elderly groups in the canvass of successful aging. Ageing Soc 2011;1:1-23. Bhatia SP, Swami HM, Thakur JS, Bhatia V. A study of health problems and loneliness among the elderly in Chandigarh. Indian J Community Med 2007;32:255-8. Singh B, Kiran UV. Loneliness among elderly women. IJHSSI 2013;2:10-4. Sebastian D, Sekher TV. Abuse and neglect of elderly in Indian families: Findings of elder abuse screening test in Kerala. J Indian Acad Geriatr 2010;6:54-60. Ubaidulla M, Inamdar IF, Aswar NR, Doibale MK, Narkhade MG. Medical and psychosocial profile of geriatric population in field practice area of Nanded, India. IOSR J Dent Med Sci 2014;13:29-33. Kumar Y, Bhargava A. Elder abuse in Indian families: Problems and preventive actions. Indian J Sci Res Publ 2014;4:1-8. Available from: http://www.ijsrp.org/research-paper-1014/ijsrp-p3498.pdf. [Last accessed on 2017 Oct 12]. Likhar SK, Rana A, Narkhede V, Choudhary SK, Likhar KS, Mishra MK. Morbidity pattern and social interaction amongst elderly living in old age homes. Biomed Pharmacol J 2009;2:327-32. Available from: http://www.biomedpharmajournal.org/?p=954. [Last accessed on 2017 Oct 13]. Tharayil HM, Thomas A, Balan BV, Shaji KS. Mental health care of older people: Can the district mental health program of India make a difference? Indian J Psychol Med 2013;35:332-4. Tiwari SC, Pandey NM. Status and requirements of geriatric mental health services in India: An evidence-based commentary. Indian J Psychiatry 2012;54:8-14. Shakeel S, Rana SA, Mallik NI. Burden of care, mental health and subjective well being of family caregivers of elderly patients. Pak J Prof Psychol 2015;6:1-16.